Scottevest travel vest with many pockets. OMG I love my Scottevest. It has 17 internal zippered pockets including ones perfectly sized for passports and ID cards, plus built-in channels for holding earbud cabling. I carry in it anything and everthing that I might need for flying: travel documents, pens, disinfecting wipes, nasal sanitizer swabs, Purell, eye drops, a tiny flashlight, lip balm, various adapters and cables, Sudafed, Benadryl, painkillers, zinc lozenges, tiny toothbrush and toothpaste, a notebook, mini-kit for repairing things, kleenex, stain removal pen, and immigration/residency documents. I wear it to and from the airport, and leave it in my suitcase otherwise. Variants. There are other versions of this vest out there (like this Tilley one or this from Magellan’s) but I’ve never tried them. The built-in cabling solution is unique to Scottevest AFAIK, and that alone would keep me with that company. Annoyingly, women seem to be underserved in this category by everyone, with nowhere near the amount of product variety that men get. 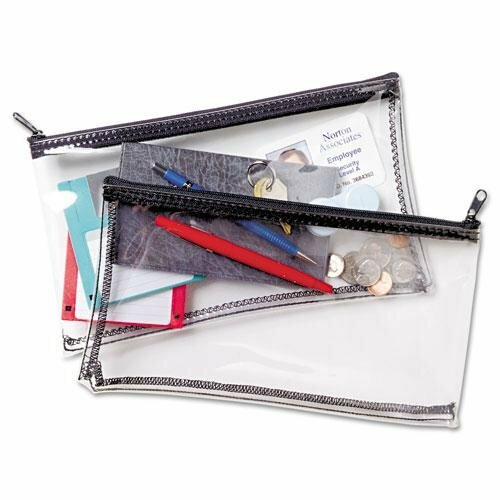 Clear vinyl zippered bags from MMF Industries. I use these to collect together small things in my luggage (e.g. power cables, toiletries) so they don’t get lost. These are great — transparent, washable including in a dishwasher, and completely indestructible. Drawbacks. None, except I wish they came in additional sizes. Variants. A lot of people recommend just using ziplocs but I find even the thicker ‘freezer’ ones rip too easily. Mesh bags and translucent bags don’t offer enough visibility into their contents, and many offer zero protection against leakage. This bag from the Container Store doesn’t pack neatly and over time the brittle plastic creases and cracks. This Tom Binh bag has fabric sides so isn’t easily washable/wipeable. This translucent bag and this canvas bag from Arsenal are super-durable but neither is transparent and I found them a little bulky. If I need something waterproof I use these clear bags from Alosak, but they’re not as durable as the MMF one: after a few trips, they often tear under the seal. Tiny clear plastic flip-top bottles from Muji. 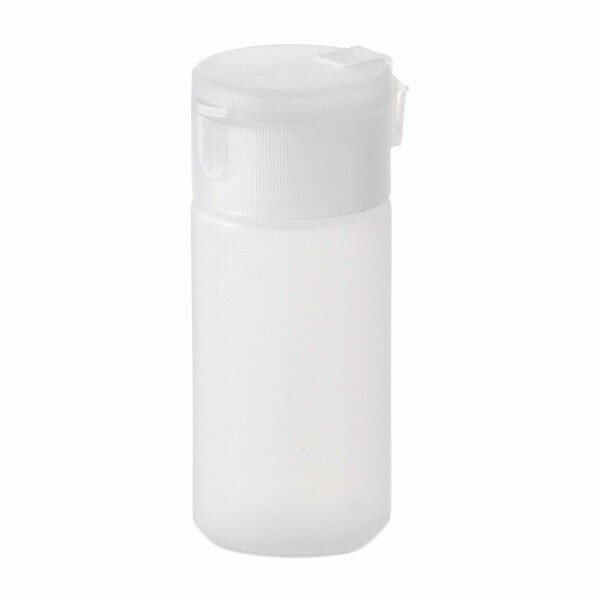 I have used a thousand variants of travel bottles/jars/tubes/whatever and these are the best — they’re great for carrying small amounts of stuff like cleanser, moisturizer and hair product. They don’t leak or drip. Squeezeable so you can get out all the contents. Translucent which means you can see when it’s time to refill. Drawbacks. Mouth is slightly too narrow which means you need to use a pipette for non-liquids, or be extremely patient. Variants. For smaller amounts or thicker products, these wee containers from Muji hold only 10g and are pretty much indestructible. For larger capacity, these Nalgene bottles from the Container Store are durable and reasonably leak-proof. These tiny ziploc bags are great for collecting together and mildly protecting small quantities of dry items like Sudafed, adaptors, USB sticks, change, buttons, stickers or jewelery, and this vitamins/medication case is rugged and compact. GoToobs are really popular but I found they leaked, and they were an awkward shape for packing. This set of stacking pill containers is also awkward for packing and breaks if you drop it, this Muji pill box is cheap-feeling and flimsy, these small Nalgene jars annoy me by having lids larger than the part you fill with product, and although these small round pill boxes from the Container Store are pretty good, they’re a hard plastic and do sometimes crack if dropped. 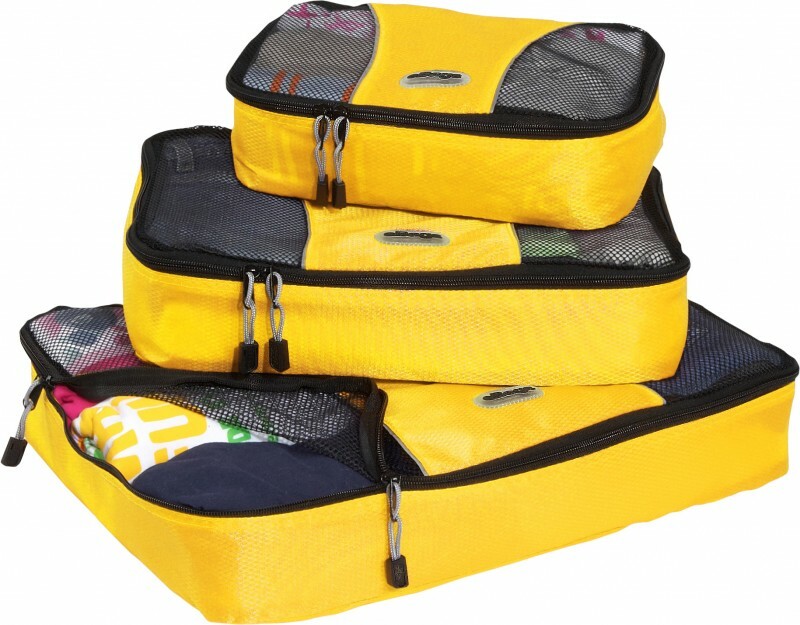 Packing cubes from eBags. Frequent travellers are split on packing cubes — some find them useful, while others think they waste space and weight. I like that they offer mild protection and keep my stuff organized, and a couple of times I’ve been grateful that they made repacking super-easy after my luggage got rummaged through by airport security. (Airport security people never actually open the cubes: I don’t know why.) I use them for clothes and non-fragile equipment/gear, particularly if it’s awkwardly-shaped. I pack clothes by outfit, which is great especially for red-eyes because I can pull out a single cube to change quickly at the hotel or airport. Variants. I’ve tried a number of variants but they all had drawbacks. I colour-code by type-of-content, which means Rick Steves cubes and Tumi cubes, which only come in black, won’t work for me. You can’t colour-code with Ziplocs either, plus they rip too easily. I find the Eagle Creek cubes too heavy and the prominent branding bugs me. Travel folders cause wrinkles and are fiddly for repacking, and they’re best for people who are carrying multiples of things like button-downs, which I am not. Compression bags cause wrinkles and can be a hassle to repack: they’re not worth it unless you’re super space-constrained. Travel shoe bags really only fit flat shoes not heels or boots, and are usually too bulky/rigid to be useful: I try to avoid carrying extra shoes but when I need to, I just wrap them in soft bulky clothing and bury them in the centre of the suitcase. 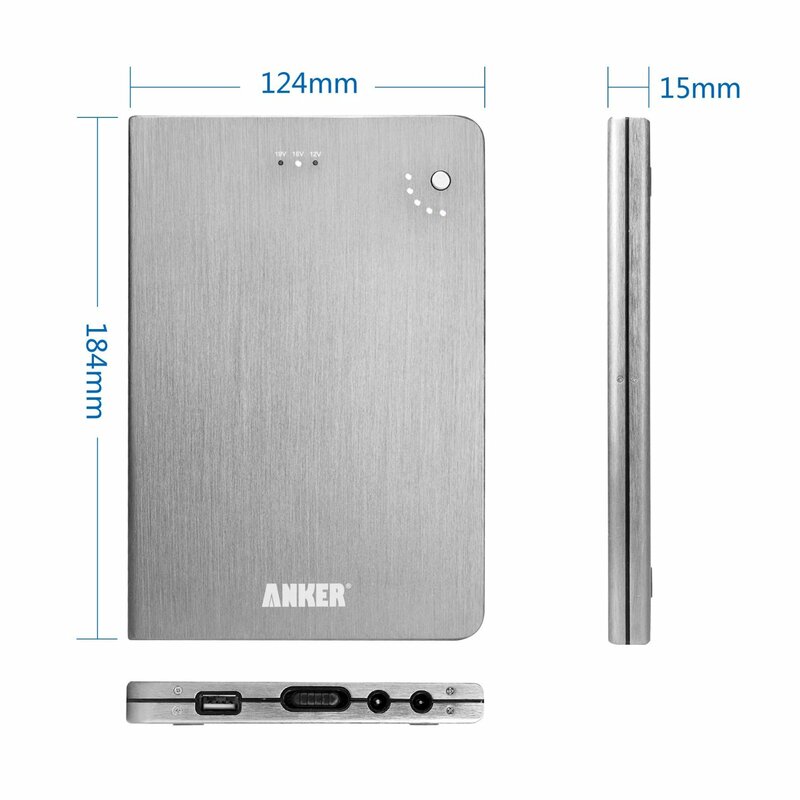 Portable battery pack from Anker. At 20000mAh, this is the highest-capacity general-use portable battery pack I know of, and when I did the math in July 2013 it had the best charge:weight ratio on Amazon. It charges my phone and tablets multiple times before needing to be plugged in — I’ve never yet fully drained it. It lives in my suitcase: I bring it with me on day trips and long flights when I won’t have access to power, and use it sometimes in hotels or public spaces when I can’t easily access an outlet. It’s beautifully designed and built. Drawbacks. Too big and heavy to drag around every day. Supports many laptops, but not mine. Variants. This 13000mAh charger from Powergen is pretty good, although I like Anker’s build quality, form factor and aesthetics better. I find the Anker fits better in my bags than this boxier 12000mAh charger from New Trent, plus I’ve had multiple New Trent products stop working for me after only a year or so. This 4500mAh charger from Anker is light and small: it’s good as a backup for giving my phone a single charge and I carry it with me everywhere, but I’m not thrilled with the hideaway cable which seems fragile. 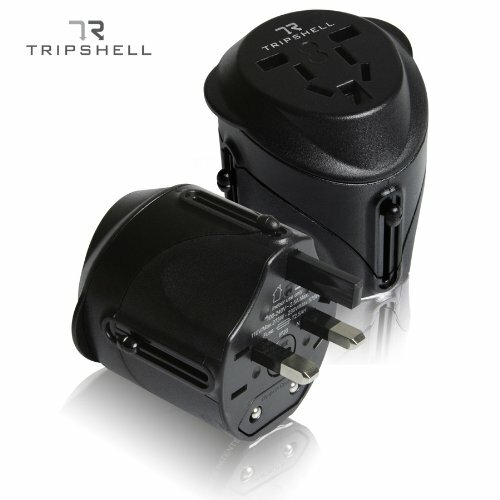 Travel adapter from Tripshell. These are well-built and durable, with no attachments to lose. I carry two or three in my suitcase and various charging kits. Drawbacks. Because they disappear against dark backdrops, I’ve left a few behind in hotel rooms and meeting rooms. (There’s a dark red and a white version but they’re not much better.) I would love if somebody made these in a fluorescent. Variants. There’s a Kensington adapter that’s practically identical to the Tripshell. The square all-in-one adapters always feel flimsy to me, plus they are slightly bulkier. Adapters with multiple components are too fiddly, and I lose the components. 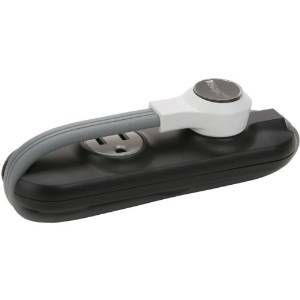 Four-outlet power strip from Monster. I love this power strip. It’s super-useful in hotels with limited or not-very-accessible outlets, and I’ve used it frequently on planes and in airports and event venues as well. It’s compact and durable, has widely spaced outlets that let you plug in multiple adapters, the plug is flat which means it fits into tight spaces, and when you plug it in it lights up to show it’s drawing charge. Drawbacks. Would be great if it had a swivel feature. Variants. I’ve used a bunch of variants but this is the best. This Belkin power strip works great at home, but is too bulky for travel. This USB wall charger from ARCTIC offers similar functionality to the Monster one, but has multiple parts that can get lost and is an awkward fit in tight spaces. This Belkin travel charger offers three outlets plus USB plus surge protection but again, the form factor limits its usefulness in tight spaces. The same is true for this wall charger from Anker, which only supports USB. 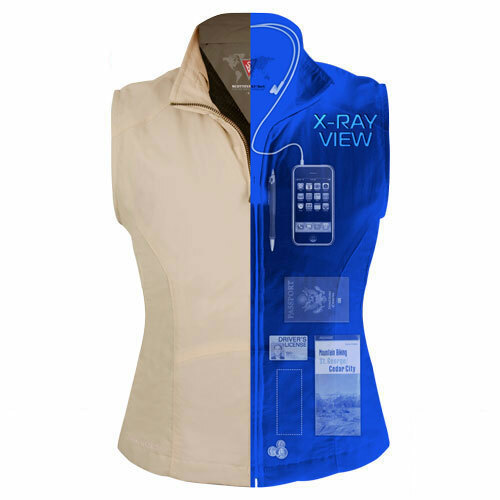 The X-RAY VIEW jacket is Super Cool!